GpxUi is a graphical user interface wrapped around GPX, a command line utility. Should work on Windows (tested on Windows 10), Mac (tested on El Capitan) and Linux (tested on Kubuntu 15 and 16). GPX is a post processing utility for converting gcode output from 3D slicing software like Cura, KISSlicer, S3DCreator and Slic3r to x3g files for standalone 3D printing on Makerbot Cupcake, ThingOMatic, and Replicator 1/2/2x printers - with support for both stock and SailFish firmwares. 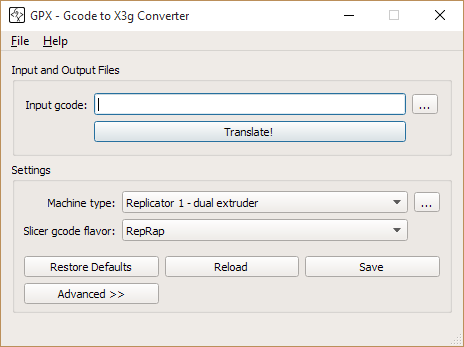 This GpxUi includes gpx.exe for use as a plugin to slicers, but also includes a settings editor and setup program to make it easy to get GPX set up and running with the right settings. Also includes a machine settings editor so you can mess with arcane stuff like how many steps per mm. It added to the end of your path, so if you have a gpx.exe somewhere else on your machine and on your path, it won’t read the settings you set in GpxUi because the other one will win and it won’t know where these settings are. You can switch the settings around and gpx.exe will just use whatever you saved last. Settings are also saved when you use GpxUi to translate a file. Setup added an icon to your desktop and to your start menu. If you like a clean desktop like me, drag the desktop one to the trash, you can still run it from start. Seems like letting you drag it to the trash was easier than bothering you with a question in setup. GpxUi includes an auto-updater courtesy of Squirrel for Windows. It checks for updates when you start it. So if you leave it running or never run it, it doesn’t update. Plus it has a limiter on it so it doesn’t check every time you boot it up, just when it has been a while. You can turn this off on the Help.Updates… menu. For Windows setup.exe: make squirrel.windows For Mac dmg: make macdeployqt CODESIGNID="signature name"
GpxUi is maintained by markwal. This page was generated by GitHub Pages using the Cayman theme by Jason Long.